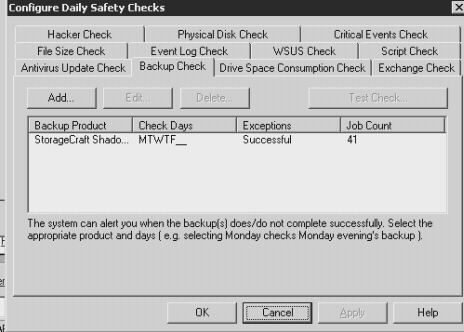 When using GFI Remote Management and Shadow Craft Shadow Protect on a x64 version of Windows you will find that the backup check will fail with the error "Product Not Found". This is because the backup check looks for the registry keys below, in Windows x64 the Wow6432Node registry key is used to contain the software registry keys and so the check fails. You can remedy this with the workaround below. Edit the registry in the HKEY_LOCAL_MACHINE key and add the key for your product version. The check will now pass. I work with several customers who have SQL databases, the applications that use these often have their own support providers and sometimes I find they leave behind a bit of a mess when they do maintenance. Often I have 5% disk space left on my database disks when they have completed a year end or stock take and left copies of databases. So I thought it was time I moved databases to where I want them and not have to rely on someone else. It is actually quite a simple process to move a database and can all be done via the SQL Query in the Studio Manager application. The first thing to do though is back up your database and the "master" database, this is really important as the master database contains the information about the configuration of SQL Server so if you lose this, you lose the lot. This will display the database and log file locations for you. Next we will detach the database. The database is now detached from the SQL Server Engine so we can move the files to their new locations. Now we reattach the database and log files. sp_attach_db "mydatabase" , "E:\databasefiles\mydatabase.mdf" , "F:\databaselogs\mydatabaselogs.ldf"
The database will now be reattached to the locations specified. You can confirm this with the location Query from the first step again. More information on this topic is found here. 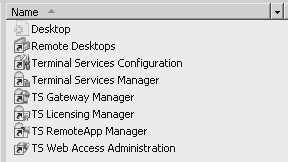 I was looking for a way to hide the Administrative Tools when locking down a Windows 2008 R2 Remote Desktop Server and I could not for the life of me find the Group Policy setting for this. Then I found out it does not exist! But this has been solved by bz4.co.uk in their blog here. Thats a big thanks to b4z.co.uk for this, their ADM file works perfectly! We all have users who have more than one mailbox, be it for an old employee or for a project. Sometimes when you set up a user with multiple mailboxes you will find that Outlook stops responding or becomes very slow to use. If you work on the primary mailbox then Outlook works normally, the user is often on a high latency connection to the Exchange Server. Well the issue is that Outlook only caches the mailbox to an OST file in cached mode for the primary mailbox, it will not do this for subsequent mailboxes so they are accessed by MAPI and that is just not going to work over a high latency connection. Well to start multiple mailboxes are not really a great idea, try to talk about Distribution Groups and SharePoint as a way to collaborate, but if you have no choice then I would crate a second Outlook profile for that mailbox and make the user switch profiles, then you can have a cached mode OST for the secondary mailbox and Outlook will perform correctly. How IT is supposed to work and how IT has to work are often two different things. Bandwidth is precious. This is a given today, our networks are demanding access to online services more than ever so I thought it is time to find out what exactly our Internet bandwidth is being used by. Once approach to this is to use the built in services on our Cisco 1841 router, the ip flow and ip route-cache command sets. Enabling the flows is actually quite simple to do, it is the recording of the data and the reporting, but more on that later. So the first thing to do is to enable ip route-cache flow on all your interfaces, these are the root interfaces and not the sun interfaces, so fastethernet0/0 ATM0/0/0 Dialer0 etc. So once you have an application to record the data you need to configure the Cisco to export the data. This exports the data to a server on 10.0.0.1 on port 9996 UDP. 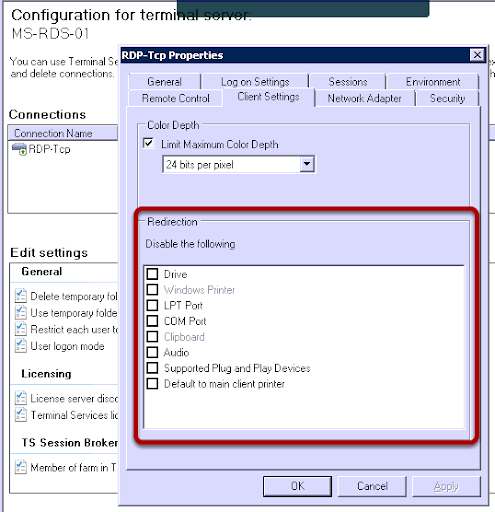 Don't forget to allow the UDP port 9996 inbound on any Windows Firewall on your server! I spent some time one day pulling my hair out because I could not redirect the clipboard to a Windows 2008 Server, so here is where you can enable and disable Client redirection so you can check this carefully and not suffer the frustration I did. This is the most common place to make this change, here you can enable and disabled client redirection options. 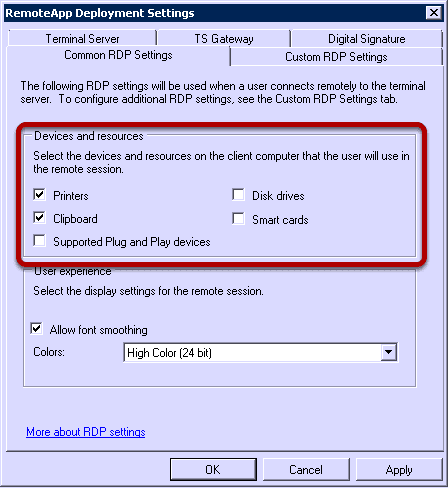 In the TS RemoteApp Manager you can select the devices that will be available to the remote session users. This was the place I had missed and caused me to spend an hour on this! The Connection Authorization Policy can also manage the client redirection. 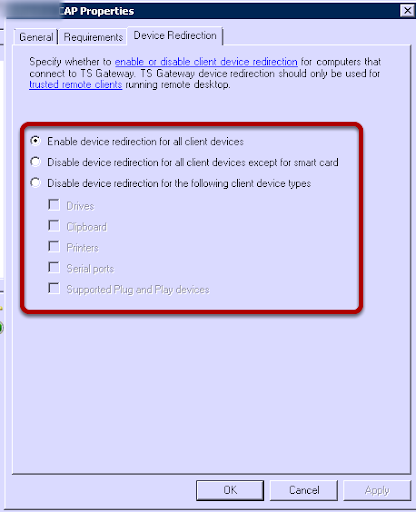 It was here that when I set this up I for some reason decided to disable all client device redirection. I must have been having a meglomaniac moment! With all the three settings in harmony I can now redirect the clipboard and printers.